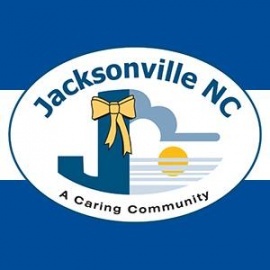 Jacksonville, North Carolina is in Onslow County and is the 14th largest city in the state. It's home to the largest Marine Corps base on the eastern seaboard. Celebrating and serving the military heroes of the world, both every day and the extraordinary military servants is what Jacksonville does best. The tree city, once a quiet farming community has grown into the business, retail, medical, banking and cultural center for the county. Jacksonville has been dedicated as a "Tree City," a honor from the National Arbor Day Association because of the city's dedication to nurturing its green spaces. The downtown waterfront park is built on the site of Wantland's Ferry, with bridges on either side of the original ferry site. Still standing at the site is also the historic Pelletier House, maintained by the Onslow Historical Society, which is opened to the public on special occasions. The park is open year-round to the public. About half of the population of Jacksonville lives in Camp Lejeune and New River Air Station. Join us in a fun night of drinks , challenging social obstacles and memories worth a snap chat story. Join us for our first Mad Hatter Tea party! Children and an accompanying adult can enjoy a fun adventure over tea and treats. This banquet celebrates women who inspire, empower and encourage girls to be PRETTY Girls. Open to Ages 21+ Girls Night Out, the #1 Ladies Night Event Is Coming to Snug Harbor on Sunday May 19th! Limited Tickets On Sale NOW! Battle at the Pines Car & Bike ShowCome check out some of the best cars and bikes from around Onslow County.